Globalization and internationally interconnected worlds open up new perspectives for us. We have been working together with an Asian engineering office in a very safe and sustainable way. Within this time we have succeeded to conform the mode of operation and know-how of our partner to our own high demands. You too can benefit from this resulting cost savings. 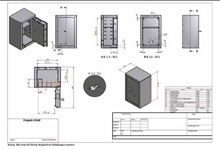 You have larger stocks of technical drawings or rough sketches in your archive and you would like to have them available in digital 3D-models and 2D-drawings? We gladly undertake the construction and preparation of these data stocks. Benefit furthermore from the reusability of the produced data in your construction environment and the therefore resulting advantages of digital prototyping.